In honor of Women's History month, St. Scholastica will host a free screening of "RBG," a documentary about Supreme Court Justice Ruth Bader Ginsburg, at 7:15 p.m. Tuesday, March 26 in room 249 in the Burns Wellness Commons on campus. A discussion will follow the film screening. Ginsburg is and has been many things: lawyer, judge, activist, daughter, mother, wife, teacher, cancer survivor, Supreme Court Justice, and cultural icon. She turned her intimate experience with discrimination into a career that has re-framed the High Court's understanding and interpretation of gender equity, liberating women and men alike. 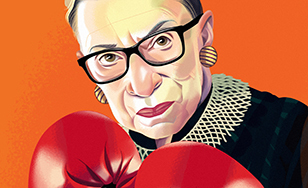 Attendees will have a chance to win giveaways including an RBG action figure, a "dissent" collar (Ginsburg is known for wearing this necklace when she disagrees with the majority of her fellow Supreme Court justices on a particular ruling), or the book "Notorious RBG."